Nike introduces the craziest "Uncle Drew" colorway yet. In celebration of Kyrie Irving's "Uncle Drew" film, Nike has released several exclusive colorways of the Nike Kyrie 4, including an all-red "Red Carpet" rendition and a white/gum version. 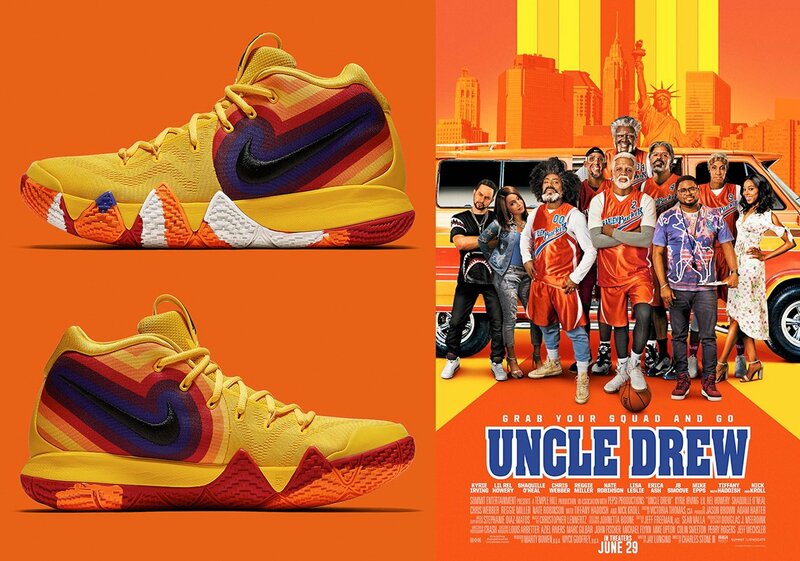 Now, Nike has plans for a third Uncle Drew inspired Kyrie 4, this time pulling on inspiration from the official Uncle Drew movie poster. As a nod to the film's elder ballers, the kicks come in an extremely retro '70s-themed design, featuring a bright yellow upper accompanied by hits of orange, red and blue with a multi-colored outsole beneath it all. As always, Kyrie's logo sits on the tongue tab and his signature is stamped on the insole. The kicks are scheduled to release via Nike.com and select Nike retailers on August 18 for the retail price of $130, though it remains to be seen how many pairs will actually be available.